“The Four Feathers” is among my favorite novels. Written by Alfred Mason in 1902, it is a fascinating story about a British officer named Harry Feversham who resigned his post just before his unit was sent to protect British interests in Sudan in 1884. As a result of his decision, Feversham received four white feathers, a symbol of cowardice, from his friends and fiancé. The rest of the story is about Feversham’s attempt to redeem his honor by traveling to Sudan in disguise. Over the past couple of days, our lives have intersected with many Syrian refugee families in desperate need. More than once as we have visited these families, I have reflected on Abou’s words to Feversham. Abou was a simple man who behaved in the spirit of the good Samaritan. Our students have also played the role of the good Samaritan. They have helped people who have shared heartbreaking stories of escaping certain death in Syria only to find themselves living lives of quiet desperation in neighboring Jordan. As if suffering unimaginable losses were not enough, these families are now struggling to survive from day-to-day. One team visited a 52 year-old man who lost his eyesight in a bomb blast. He and his young teenage son escaped together — the son leading his injured father the entire way. 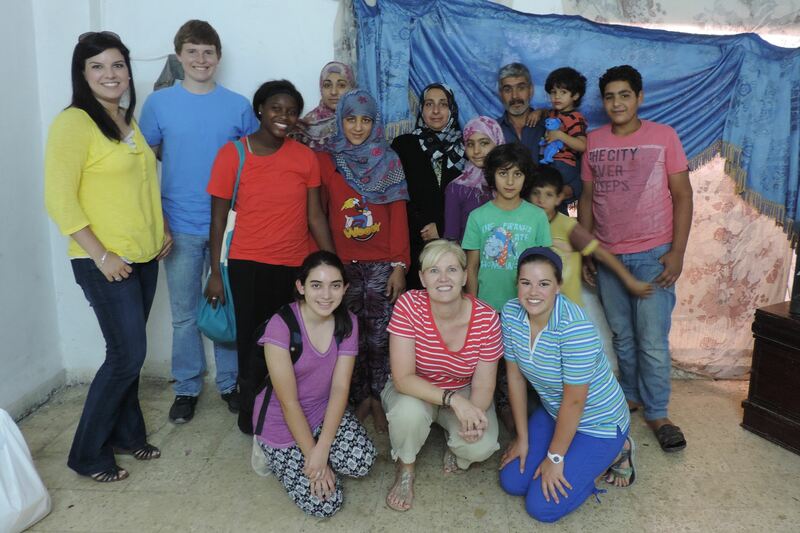 Another team met a family that arrived in Syria two months ago. They live in one small windowless room and have only the clothes they were wearing when they escaped. 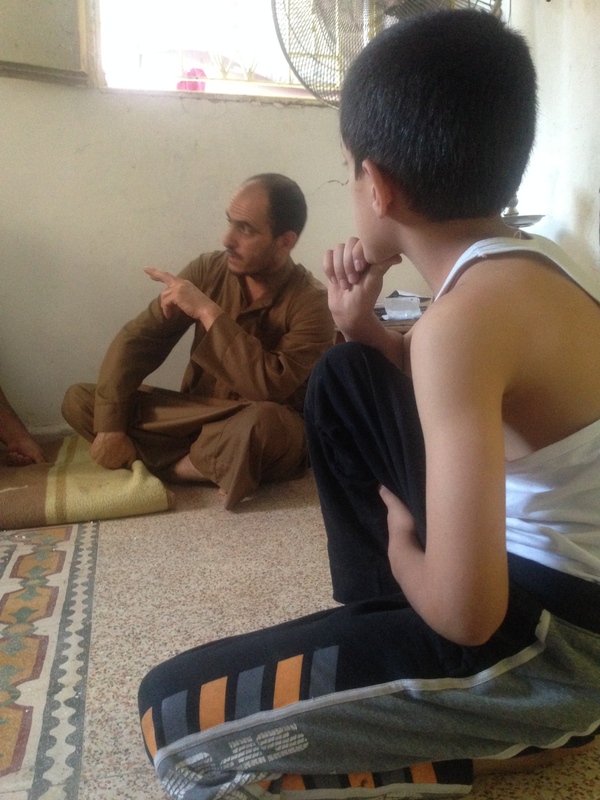 Another man shared how Assad’s soldiers had tortured him by pulling his teeth. Still another 32 year-old woman and mother of eight lost her 47 year-old husband to a heart attack two months ago. When our team arrived they learned that she was to be evicted the following day. We paid her rent. These are just a few of many of the stories that we heard today as we canvassed the city to visit Syrian refugees. There are hundreds of thousands of more stories just like these that are waiting to be told. While every family we visited appreciated the humanitarian aid we provided, they were even more grateful that we had traveled so far just to reach out to them. They desperately needed the hope and encouragement we offered, perhaps more than the groceries we delivered. Many expressed that just knowing that they are not forgotten and that someone is praying for them has made all the difference. The members of this family live in a single room and own only what they are wearing. Sooner or later, we all find ourselves living the role of either Harry Feversham or Abou Fatma. When we find ourselves in dire straits like Feversham, the thing we need most is a good Samaritan like Fatma, someone who is willing to do whatever it takes to help another. More often, most of us are in the position of Abou Fatma. We can do something to help those whom God puts in our way. And, we should do something, even it it means altering plans or digging a little deeper into our wallets. Because Feversham’s life was saved by Fatma, he was able to go on his way and ultimately saved the lives of others. You’ll have to read the book or see the movie to find out how. You just never know what the next chapter will hold for those we help because God put them in our way. As you go about your day, look for Harry Feversham and when you find him, give him a hand. Your act of kindness will have a reach farther than you can imagine. Tears… I am very proud of our students just from what you have written. Praying for y’all. Thanks, Sterling. We appreciate your tears and your prayers. Thanks for following our journey.